"41CP12, Burial 6, Pot 6" by Timothy K. Perttula and Robert Z. Selden Jr.
DECORATION: The inverted rim has nine narrow and oval-shaped engraved panels divided by broad cross-hatched engraved brackets. Each oval panel has a smaller cross-hatched and centrally-placed oval element within it (Figure 44). 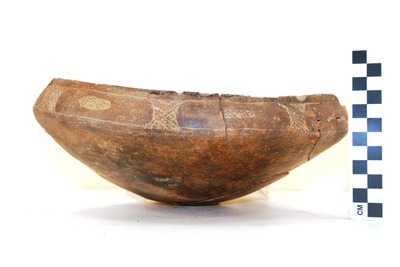 Simms Engraved carinated bowl, Burial 6, Pot 6.